My goodness, is it Saturday already? Where has the week gone? Apparently it’s been a busy week for me. Just a quick post today, too, as I’m headed out to my parents’ for the weekend. When out hiking the 100-acre woods last week, I found this sawn tree. In any woods, trees fall with some regularity as they become old, diseased, or are taken down by weather phenomenon such as lightning or heavy snow or ice. I’m not sure why this one came down, though I think it was probably killed by insects, given that it didn’t look all that large. It’d come down across the trail, and I’d noticed it a few times over the last year of hiking the woods. Last week when I went by I noticed that the neighbour, who tends the trails in exchange for being able to ride his ATV there, had brought his chainsaw and cleared out some of the fallen logs. I love to count tree rings, when I find stumps like this. You can’t do it on most natural stumps, of course, because they rarely break cleanly enough for you to see the individual layers. But a sawn log is easy to read. I snapped a photo and when I got home, counted the rings using Photoshop to keep track (otherwise I lose my place when I get halfway through). This tree was 51 years old when it died. I think it came down in 2009, though it’s possible it had died sometime before that. That means that, at the latest, it started growing in 1958. I look at those rings, and try to think what each one represents, what was happening that year while the tree stood stolidly here, time flowing by. I can find the year I was born, halfway in. I like how you can see the knots formed by the bases of branches. These would have grown when the tree was smaller, and as it continued to lay down wood each year, the bases of the branches would get overgrown and incorporated into the trunk of the tree. We can discern the individual rings of growth because wood grown at different times of the year tends to have a different colour. The highest rate of growth is during the spring and early summer. It’s lighter coloured and usually thicker in width than the stuff that’s grown later in the summer. By fall growth has nearly stopped as the tree prepares for winter dormancy. 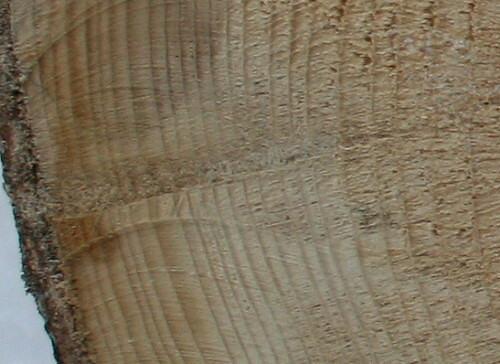 The light-coloured part of the ring is called “early wood” or “spring wood”, to reflect the time of year it was grown, and the darker stuff is “late wood” or “summer wood”. The lighter colour is probably due to the more porous nature of spring wood compared to the denser material of the summer wood. Variation in the width of the bands reflects growing conditions of that particular season. Years with good rainfall and temperatures will result in more wood growth, while especially dry years, or cold years, will cause stunted growth for the year. If you count back 8 or 9 years there’s a really broad band with thick growth of both spring wood and summer wood. My guess is that the summer was wetter than normal, allowing the tree to keep growing longer than it would normally. Just a few years later the weather had flipped, and thin rings suggest a particularly dry year. 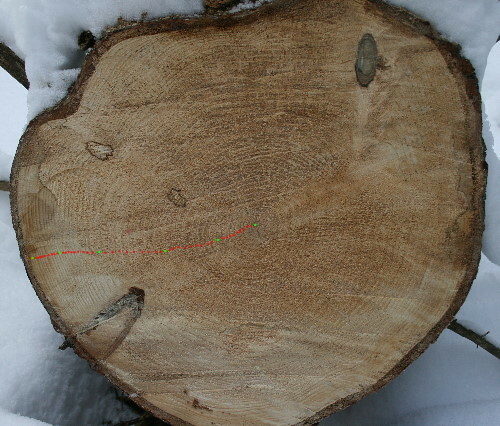 Younger trees tend to put down more wood per season than older trees, too, which is why inner rings are often wider than outer ones (compare the width of the second and third decades in the top photo to the fifth decade). It could also be an indication of localized growing conditions – perhaps when it took root as a seedling the canopy was closed, but somewhere late in its first decade a neighbouring tree fell, opening up the canopy and letting in more light and rain. I’m sure a dendrologist (one who studies trees) would know better the life story of this individual, but I enjoy hypothesizing. It’s always interesting to ponder/fantasize on the life of trees. Nice post, Seabrooke. It makes me think of one of my favorite Aldo Leopold chapters describing local history as the sawyer works through an old tree.